UnHackMe - One Time Payment! Lifetime free updates! 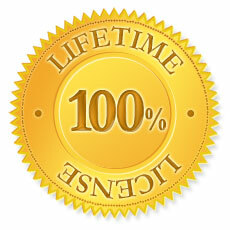 Your purchase includes LIFETIME license with LIFETIME updates! You pay only One Time! Support is included into your purchase. Our support team has only one level: LEVEL 1. You will get the professional help within 24 hours. If your case is too complex, Dmitry Sokolov (developer of UnHackMe) will help you using remote access. 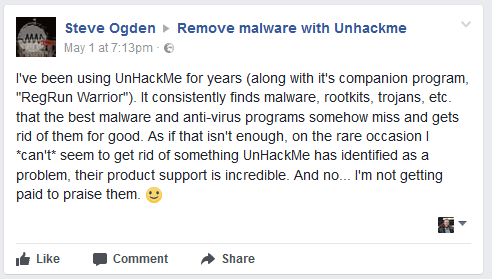 You can check the real reviews of UnHackMe on the Facebook. Family License is recommended if you and your immediate family intend to use the software on any number PCs of one household. You may not use or execute the licensed software at work, for a commercial purpose, in a commercial context or environment. Recommended if you are the only user of the software and use the software at work and privately on one PC per time (e.g. on your work PC, your private home PC and on your laptop). You may use the licensed software on all computers that are used by no one else but yourself. You may use the licensed software at work, for a commercial purpose, in a commercial context or environment. You may not use or execute two or more copies of the licensed software at the same time (e.g. on a server and on your home or work PC). Allows you to run UnHackMe from a CD or USB stick on the on a specified # of user computers without installing UnHackMe. You may copy UnHackMe software only for backup purpose not for transferring UnHackMe software to other person. Advanced tools for removing Viruses/Trojans/Adware/Spyware and Rootkits using unique UnHackMe technology. Only for Professionals! The Students, Faculty and Staff of accredited Colleges, Universities, schools and other institutions are able to purchase UnHackMe for a special price.